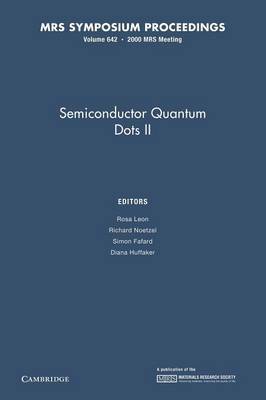 This book confirms the high level of international interest in understanding and control the properties of semiconductor quantum-dot structures and devices. It highlights the self-assembled (self-forming) type of quantum dots that result from the islanding transition in strained heteroepitaxy of III-V semiconductors. It also features nanocrystals, colloidal dots and biological applications. Technological applications span quantum-dot laser diodes, quantum-dot optical amplifiers, biosensing applications, infrared photodetectors, photovoltaic devices, quantum cellular automata and magnetic semiconductors. It reports the development by researchers at the Johannes Kepler University in Linz of a mid-infrared, vertical cavity surface emitting quantum dot (QD) using the lead salt compounds PbSe and PbEuTe; optical gain and stimulated emission in colloidal quantum dots and the use of quantum dots for optical amplifiers reported by researchers at the National Institute of Standards and Technology in Boulder. Topics include: theory, modeling and simulations; nanocrystals, colloidal dots and biological applications; quantum-dot-based devices and transport studies; carrier dynamics and interactions and energy relaxation and single-dot spectroscopy.